The Internet is all about people. Websites are designed as information hubs and interactive applications catering directly towards people. So it should be natural to assume that designers and developers want to fix up troubling issues within the user experience. Unfortunately it seems like this process has fallen to the wayside for a number of reasons – the largest of which being complexity. In this guide I want to share a few ideas on usability testing and the value it can provide. Granted it may be a very detailed topic but it’s nothing convoluted or difficult to understand. Anyone who puts their mind to the task will be able to comprehend the basics and start integrating usability testing into every project. 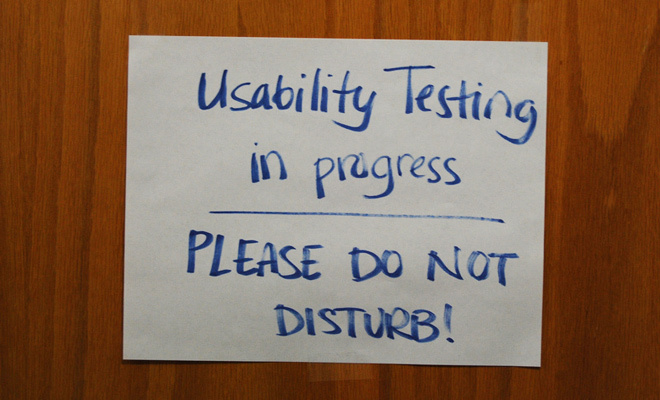 One of the biggest troubles with usability testing is the time required to perform tests. Many of the online tools cost a small amount of money which is immediately off-putting. Yet even local testing with a small feedback form requires development time even if it doesn’t cost any money. For example, with mobile users it shouldn’t be difficult to garner feedback and opinions on the difficulty of browsing the website. You could place a small contact form on the site or use a small banner ribbon at the top of the page. Of course there are dozens of topics surrounding usability design aside from mobile interfaces. But even though many of them require time I feel every second is worthwhile. Some may disagree with my premise, but I feel that usability testing when done properly only needs to be done once. The results you obtain from a series of tests and fixes on a layout can prove useful for years. There’s nothing wrong with performing new unique tests every-so-often but at some point it may be fruitless. Keep that in mind when pushing off usability concerns because although they are real, they are also short-term and best dealt with immediately. Every piece of media emanates content worthy of judgement at first glance. Whether we’re talking about a book, video, painting, or website, the first impression is going to leave a mark. In web design part of this impression will always be based on the design – color scheme, page elements, structure, navigation, font choices, etc. But other semi-tangible factors also play a role in this first impression. For example how the page loads and how many elements are placed on the homepage. Also consider how you would feel landing on a website with only a logo or graphic. No description, no information, some links but ultimately confusing and slightly annoying. The amount of information used on a homepage is very important. But how the information is presented also matters a great deal. You have to cater towards people who are visiting the website for their first time. They have no idea what’s going on and they might be very interested in the product or service, assuming it’s presented in the right way. Five Second Test is a useful tool for just this situation. Basically you would upload a screenshot of an existing website layout and testers will browse these screenshots for five second intervals. They are given ample response time to record their thoughts, likes, dislikes, and suggestions for the designer. Utilizing a resource like this is questionably one of the greatest choices you can make. It requires tact and a tough outer skin to handle feedback. Yet it can be an amazingly powerful tool even before launching a full website online. 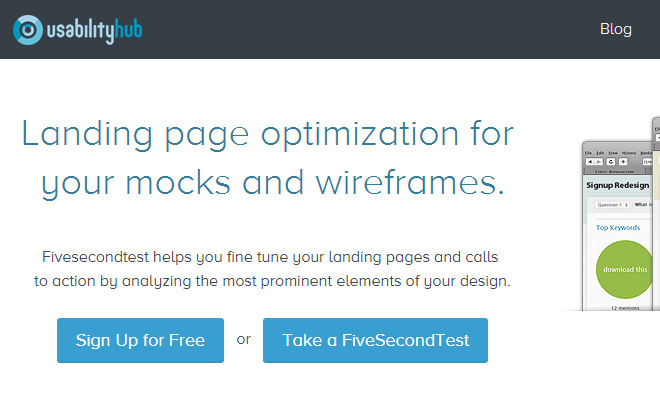 Keeping load times down to a minimum is a crucial aspect of usability testing. Visitors tend to veer away from pages that take a while to load. In this modern era it’s almost pointless to wait around for a slow-loading site because Google offers thousands of similar results. When it comes to interactive websites like social networks or blogs try to keep dynamic content to a minimum. Anything which doesn’t improve the branding or content should be scrapped. On the contrary you might spice up more static websites such as landing pages or personal portfolios. Just keep in mind that everyone is busy and time is a precious resource. Recently ALA published an article on this topic about planning for performance. Generally you want to consider actions and usability from the user’s perspective. While you might enjoy big fancy design elements this may not a great choice for the current project. Through practice you’ll learn how to judge ideas from a clearer perspective by placing the “typical user” ahead of your own opinion. Checking for usability pitfalls is only the first step in a detailed remedial process. Ultimately your goal should be to fix up a website to allow greater support for interaction. Yes design is a big piece of this puzzle, but a well-designed layout can also be non-functional. But no layout is ever completely incorrigible. The final goal seems complex but everything can be boiled down into bite-sized chunks of information. First run some tests and determine which areas seem the most troublesome. Are users having a difficult time with the navigation? What about reading page content, or accessing the website via mobile devices? Once you have a list of problems the next step is to think critically about possible fixes. In some cases it might be as easy as increasing the standard font size. Other cases might require a restructuring of the entire website to get it working responsively. Is this worth your time? That’s a very subjective question and applies on a case-by-case basis. But if you really want to solve usability problems everything starts with the user. A little bit of testing and feedback can garner tremendous results. Then once you have an understanding of the problems you can start to think about how they might be solved. Nothing requires a single solution as there are many different alternatives – especially for complex issues. Stay the course and keep high spirits that you’ll be able to overcome any usability issue. There is no right or wrong process when it comes to usability testing. The overall framework follows a schema of test, then fix, then test until positive results are achieved. Prototyping is a great tool for achieving this functionality along with live website testing. It’s never too late to begin testing and you can always make usability fixes at any stage of the design process.